This page explains how to manage an App Engine project using Apache Maven, a software project management and comprehension tool. It is capable of building Web Application Archive (WAR) files for deployment into App Engine. Google provides a plugin and Maven Archetypes that are supported by Maven 3.5 and greater. 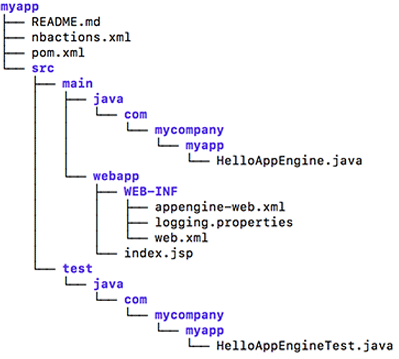 Maven downloads the Java libraries from the Google App Engine SDK. You can use Maven to test your app locally and deploy it to App Engine. Note: If you want to migrate from the Java App Engine SDK-based plugin (com.google.appengine.appengine-maven), to the Google Cloud SDK-based (com.google.cloud.tools.appengine-maven) plugin, read Migrating to the Cloud SDK. Select or create a new GCP project. If you need to create an App Engine application for your project, follow the prompts to select the region where you want your App Engine application located. If you already have the gcloud command line tool installed and want to set it to use a different GCP project ID than the one that you initialized it to, see Managing Cloud SDK Configurations. Note: Optionally, run gcloud auth application-default login to authorize your user account without creating a Cloud SDK configuration. You can also run gcloud auth activate-service-account --key-file=your_key.json if you want to use a service account. For more information, see Authorizing Cloud SDK Tools. Note: Make sure you have the latest version of the Cloud SDK for Java by periodically running gcloud components update. If you don't have Java, download, install, and configure it. Set the Java compiler flags in your project's pom.xml to specify Java 8 bytecode. Download Maven 3.5 from the Maven website. Install Maven 3.5 on your local machine. Note: Linux users may need to download Maven instead of using apt-get install to install Maven 3.5. Note: If there is a newer version, upgrade to the latest version. App Engine app appengine-skeleton-archetype Generates a new, empty App Engine project ready for your own classes and resources, but with required files and directories. App Engine app appengine-standard-archetype Generates a basic Java application for the App Engine standard environment. App Engine app appengine-flexible-archetype Generates a basic Java application for the App Engine flexible environment. During project creation, Maven prompts you to supply groupId, artifactId, version, and the package for the project. groupId A namespace within Maven to keep track of your artifacts. When people consume your project in their own Maven Project, it will serve as an attribute of the dependency they will end up specifying. artifactId The name of your project within Maven. It is also specified by consumers of your project when they depend on you in their own Maven projects. version The initial Maven version you want to have your project generated with. It's a good idea to have version suffixed by -SNAPSHOT because this will provide support in the Maven release plugin for versions that are under development. For more information, see the Maven guide to using the release plugin. package The Java package created during the generation. The following procedure describes how to use the appengine-skeleton-archetype to create an App Engine application. Note: Some of the following commands can take time to execute, and some can potentially download large artifacts. We recommended that you run these with a good internet connection. Change to the directory where you want to build the project. Set -Dappengine-version to the most recent version of the App Engine SDK for Java, and application-id to the ID of your GCP project. To create an empty project that contains the required directory structure and files, ready for your own classes, supply the number corresponding to com.google.appengine.archetypes:appengine-skeleton-archetype. Select the most recent version from the displayed list of available archetype versions by accepting the default. When prompted to Define value for property 'groupId', supply the desired namespace for your app; for example, com.mycompany.myapp. When prompted to Define value for property 'artifactId', supply the project name; for example, myapp. When prompted to Define value for property 'version', accept the default value. When prompted to Define value for property 'package', supply your preferred package name (or accept the default). The generated Java files will have the package name you specify here. When prompted to confirm your choices, accept the default value (Y). Wait for the project to finish generating. then change directories to the new project directory, for example myapp/. Create your application Java classes and add them to src/main/java/.... For more information, see Getting Started. Add the UI that you want to provide to your app users. For more information, see Adding Application Code and UI. The artifact you used to create the project has done the basic src/main/webapp/WEB-INF/appengine-web.xml configuration for you. However, for more advanced configuration, you may need to edit this file. For more information, see Configuring with appengine-web.xml. Edit the file src/main/webapp/WEB-INF/web.xml to map URLs to your app handlers, specify authentication, filters, and so forth. This is described in detail in The Deployment Descriptor. Change to the main directory for your project. Optionally, test the application using the following procedure. During the development phase, you can run and test your application at any time in the development server by invoking the App Engine Maven plugin. Use your browser to visit http://localhost:8080/ to access your app. Shut down the application and the development server by pressing Control-C. In this example, the <devserver.port> sets the port to 8181 instead of the default, and the address 0.0.0.0 is specified, which means the development server will listen to requests coming in from the local network. The prefix devserver is optional; you can use <port>8181</port> instead. The appengine:deploy goal and all other goals in the App Engine Maven plugin have associated parameters that you can use. For a complete list of goals and parameters, refer to App Engine Maven Plugin Goals and Parameters. Explore the App Engine Maven plugin code and report issues on GitHub. Learn how to specify parameters for goals by referring to App Engine Maven Goals and Parameters.